Many factors affect demand for vehicle fuel, including price, income, fuel efficiency, quality of alternatives (public transport) and general preferences. If we ignore all the income effects, social effects and changes in consumer preferences (which admittedly is very significant) we can make a very rough estimate at the price elasticity of demand for vehicle fuel. It is what we would expect – demand for vehicle fuel is price inelastic, but higher prices do reduce demand somewhat. 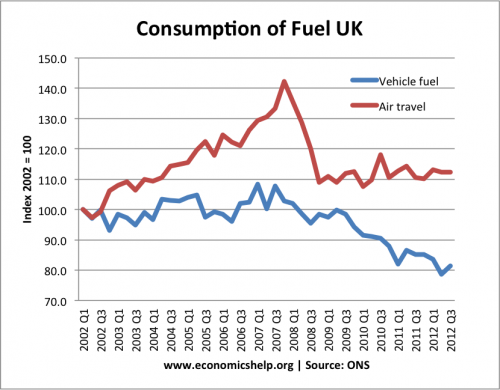 The graph shows that air fuel is much more sensitive to income effects. During the start of the recession from 2007 to 2009, demand for airline fell almost 30% in a short space of time. This indicates that airline fuel is income elastic – sensitive to changes in income. Airline fuel has not really recovered from 2009. The recession will also be having an impact on demand for petrol. The biggest decline for vehicle fuel has occurred during this period. Faced with rising prices and squeezed real wages, people have been cutting back on vehicle fuel. When the economy recovers, we can expect a renewed increase in demand for vehicle fuel. With a rising population, British roads are becoming more congested, this decreases the desirability of car journeys. 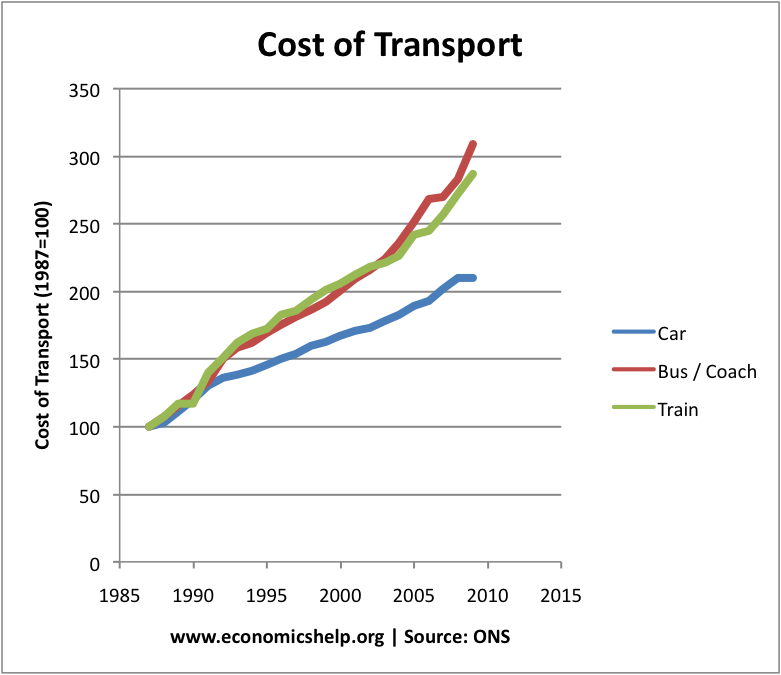 For example, we have seen a growth in rail transport – despite higher rail prices. Suggesting people are seeking to avoid congested roads if possible. This gives a clear incentive for consumers to choose more fuel efficient cars. It also gives producers an incentive to develop more fuel efficient engines. In the long-term, this price incentive may continue to drive improvements in fuel efficiency which reduces fuel consumption. It is possible some people are influenced by non-economic factors. For example, cycling and walking to help promote a better local environment. What will happen in the next decade for fuel consumption? Fuel consumption is likely to increase. When the economy recovers, more people will be able to afford it. Predicting supply and price of petrol is not easy. But, it is unlikely that we will see another 85% increase in price. However, what we will see is a continued move towards greater fuel efficiency and ultimately the development and implementation of different fuel sources. This is not a statistics for fuel consumption, but it shows the dominance of the car in the postwar period. 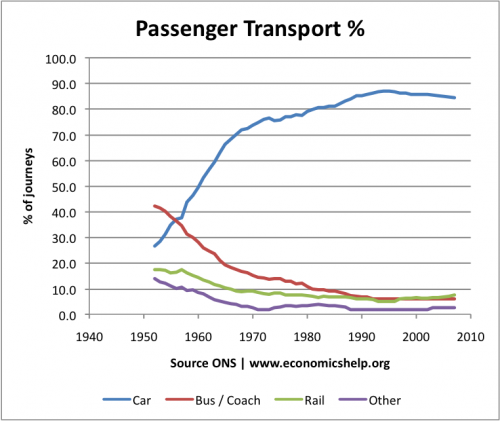 The decline in car journeys in recent years, is only the tip of the iceberg. This entry was posted in Uncategorized and tagged petrol, transport. Bookmark the permalink.